General size guide for ladies. Please note the waist measurement should be taken when seated. Please note the colour and style of the bow may be different to that illustrated. For customers who are visually impaired a bow can be applied which is dark pink to give a higher contrast between the background colour of the briefs, to help with front and back identification. These side opening trousers were requested by a wheelchair user who hoist transfered. His carers had to roll him from side to side to put on conventional trousers. This was too stressful for both him and those responsible for his care. He asked for a pair of trousers which could be opened out as flat as possible to enable him to be laid into them. (It was not possible to make trousers which opened totally - the trousers open 99%) The William Side Opening Leisure Trouser is the outcome of his request. 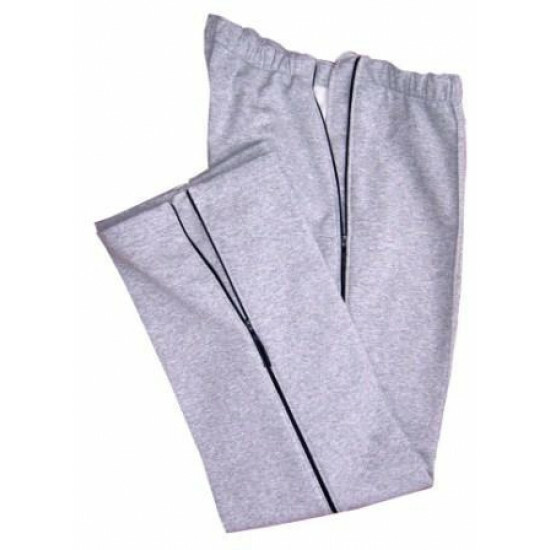 The Side Opening Trousers are made from a Cotton/Polyester brushed back sweatshirt fabric, for comfort, warmth and durability. Zips are inserted along the entire length of the side seams, which can be opened from the waist down to the leg hem or the leg hem up to the waist, making dressing and toileting easier. Internal fabric zip guards are attached to the inside of the trouser to prevent any possible discomfort from the zips. Please note the zips are NOT open ended so cannot be opened entirely. Different leg lengths are catered for. If you have any queries please feel free to contact us. Different colour options available, please note the Grey Marl colourway has Black zips. Other colourways are available, as well as different fabrics which are special makes. Please contact us for details and swatches. The elasticated waist is finished to a more generous measurement than most elasticated trousers to optimise comfort for the wearer. The back rise of the trouser has been extended to take into account the seated posture. Length --- Please Select --- Short 29" Standard 31" Long 33"
All orders are sent recorded delivery. Full refunds on unused in new condition returns.